WAGHENAER - Universe Europae Maritime Eiusque Navigationis Descriptio. Generale Pascaerte van Europa . . .
WAGHENAER, L.J. - Universe Europae Maritime Eiusque Navigationis Descriptio. Generale Pascaerte van Europa . . .
Universe Europae Maritime Eiusque Navigationis Descriptio. Generale Pascaerte van Europa . . . - WAGHENAER, L.J. Title : Universe Europae Maritime Eiusque Navigationis Descriptio. Generale Pascaerte van Europa . . ..
Map maker : WAGHENAER, L.J.. Size : 23.8 x 20.7 inches. / 60.5 x 52.5 cm. Description :This general chart of north-western Europe and the surrounding coastal waters is from the rare pilot-guide De Spiegel der Zeevaerdt , printed by Christopher Plantin in Leyden. FIRST PLATE AND FIRST STATE, which appeared in the first 3 editions, before Latin names of some seas and inscriptions in the scale bars were added. (editions 4-12). EXTREMELY RARE. The map's title is given in both Latin and Dutch, with the latter attributing it to Waghenaer and nothing a privilege of ten years. The date 1583 is engraved in a box capping the title cartouche. The chart is signed "Ioannes à Doetecum". 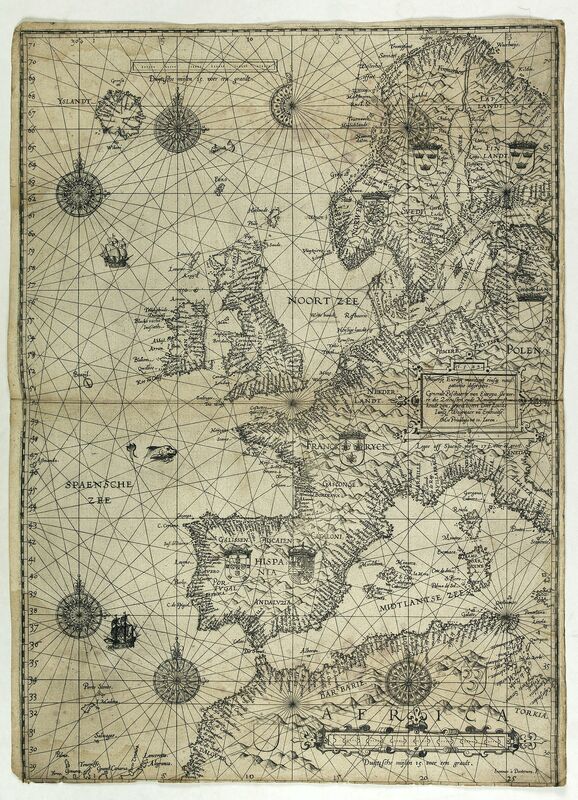 It may have been that Waghenaer had already sold this portolan chart in 1579. Engraved by Johannes van Doeticum, and embellished with ships and overlaid with directional rhumbs radiating from decorative compass-roses typical of portolan charts which were no doubt sources for this map. The scalloped design of the shores is also characteristic of the portolans. In the land-part the coast-of-arms of the various European countries. The place names are written inland continuously around the coast from north to south, in order to facilitate the navigator's readings accomplished by rotating the map. 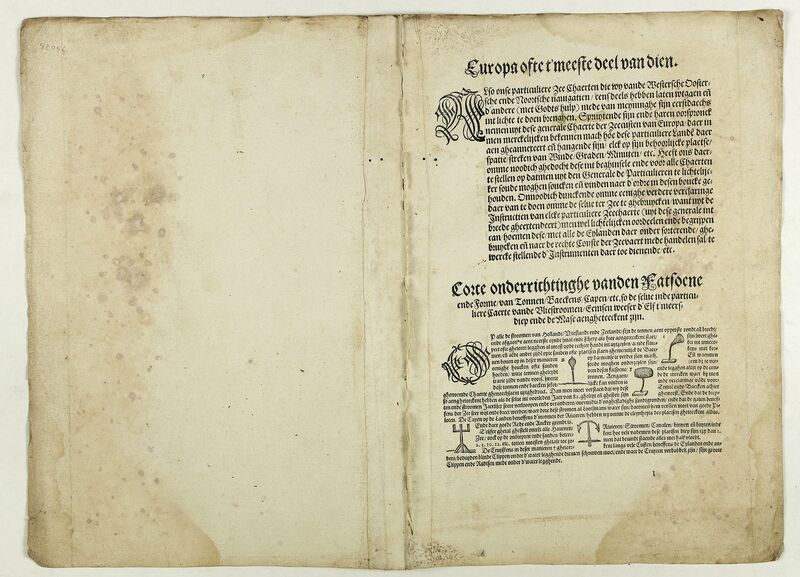 Condition : Dutch text on verso. Some browning, foxing. A few worm holes filled in. The Europe chart is larger than the other charts in the atlas, as often the case the lower margin is trimmed affecting part of the grade scale. Dark impression.